Think about why are you starting a blog and why people should be interested in following you. There are several reasons why people blog but as my opinion, peoples blog because they want to convey their passion to the rest of the world, just like me! In earlier days 10 to 15 years ago, the blog didn’t exist. But today there are over 100 millions of them. There are even distinctions among types of blogs – business, fashion, food, lifestyle, technology, news and entertainment blogs, among others. While the blogging site has developed over the last century, the benefits of blogging are still bountiful. The reason for blogging can be different from time to time but first, you have to know what is a blog? According to me when people are in need of information which is rare to find, they simply go to “Google” or other search engine sites & type the information they want. And in seconds they get their accurate results without much effort. Now if you ask me, from where these results come from? The simple answer is blogs and websites. 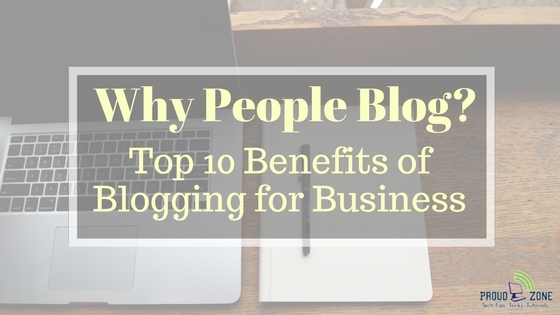 There are many reasons why everyone loves blogging, below are the list of its benefits! Blogging can also have financial benefits. You can place ads on your blog and receive Affiliate commissions by promoting products of established online retailers & also you can sign up for Google Adsense to earn a great revenue. You can also sell your own products online with the help o blogging! Once you start blogging, you’ll find yourself becoming a better writer. Mastering content takes creative thought. When you become an expert in creating great pieces of content for your blog, your writing, thinking and research skills will improve the process. Blogs are wonderful tools to help people establish themselves as experts in a field or niche. We all have some kind of interest and expertise to share with others. If you’re able to create great content on your blog and/or have a unique point of view on the topic, then be assured that your future audience will recognize it and reward you for it. Today, the Web has different experts and different opinions on almost every topic you can dream up. With a bit of effort, you too can become an authority in the area of your interest. The more involved you become with blogging, the more creative Ideas will flow in your mind. That’s one reason why blogging is so popular. As you gain knowledge about your topic, the confidence you’ll build in your followers and most importantly, in yourself, will make you fly up. All of this leads to increased creativity. So, whenever you will be writing a book, piece by piece, on your blog. Keep an open mind and enjoy your new-found confidence in your own abilities! With practice and a little effort, you can easily build your base of blog fans and followers. As you become known as an expert in your niche, you can inspire, encourage and help others to make a difference in their own lives. Along with your blogging journey, you will make new friends and connections throughout the world. If you like to travel, that means a lot of couches are available for you to snooze on while winging your way around the globe! Starting a blog is a guaranteed way to expand your network. First of all, valuable and interesting blog posts attract readers who will then comment on your site and send you personal messages through your contact page. Many of your readers will be asking for help, but others will be looking to help you. A blog is also a good platform for reaching out to others. Many of the first posts on Income Diary were interviews with experts in the make money online community. Nowadays Blogs have become an integral part of our online culture. Practically everyone reads blogs now, whether they’re “official” news blogs associated with traditional news media, topic-based blogs related to one’s work or hobbies, or blogs purely for entertainment, just about anyone you ask has at least one favorite blog. Now I hope this post cleared all of your confusions about blogging profits! If you found the content useful than share it with your friends, colleagues on Social Media.